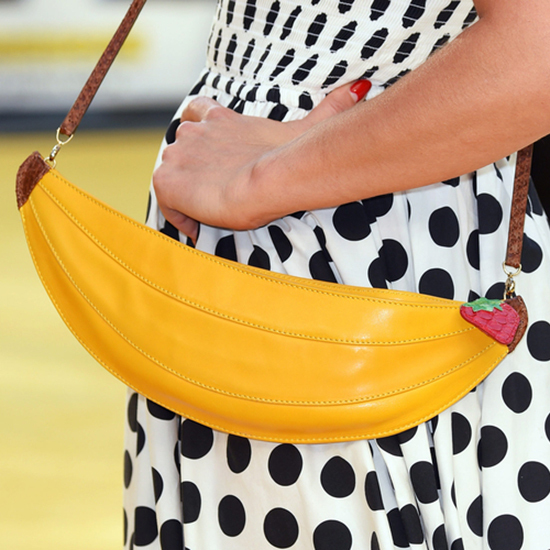 First seen on street-style It girls, fruit has quickly become fashion's newest It accessory. Below, we’ve coupled our favorite fruit clutches with complementary summer dresses. Now that’s some food for thought! Swap your traditional basket bag for a more playful option. Your weekend brunch ensemble just got more interesting. Shop the combo: Betsey Johnson clutch, $78; betseyjohnson.com. Zara dress, $60; zara.com. Punch up the pastel colors seen in this Pixie Market dress with a brighter version of them in this watermelon clutch. Shop the combo: Nasty Gal clutch, $35; nastygal.com. Pixie Market dress, $96; pixiemarket.com. Try playing up complementary patterns. This Miu Miu dress gives an abstract take on the seeds in this Charlotte Olympia clutch. Finish off this bold outfit with a neutral shoe. Shop the combo: Charlotte Olympia clutch, $547; charlotteolympia.com. Miu Miu dress, $1370; netaporter.com. Highlight the yellow in this patterned dress with a matching banana clutch of the same hue. Shop the combo: Asos clutch, $28; asos.com. H&M dress, $40; hm.com. Stick to just one color from the clutch. Here, we’ve played up the green stem with this matching dress. Plus the contrasting textures add depth to your look. Shop the combo: Kate Spade clutch, $348; katespade.com. Topshop dress, $70; topshop.com.